A round countertop ... Strada collection. Strada is a sophisticated collection that gives bathrooms at home the look and feel of those found in luxury hotels. For those wanting to create stunning bathrooms at home that look like they belong in a luxurious hotel, Ideal Standard says it has just the collection for you. “Ideal Standard’s Strada collection is a wonderful and sophisticated range; its cross-category items consisting of stylish washbasins, bathtubs, shower trays and mixers are perfectly shaped for contemporary living,” says a company spokesman. He continues: “Bathrooms have become an important part of the household, a refuge of relaxation and invigoration. Bathroom design is about defining how you use the space you have available to fit your lifestyle. And nobody does it better than Ideal Standard, one of the leading providers of innovative bathroom solutions operating across Europe, Middle East and Africa. 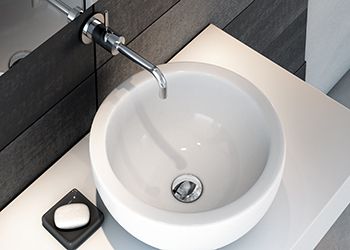 The Strada collection of washbasins has it all; basins, vanities, vessels and countertops. A variety of shapes and sizes allows creative freedom that can address different needs and style. These washbasins not only look good, but are also deep enough to be practical to use, he says. 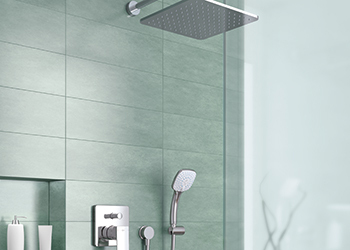 The complete showering solution from Strada. “Basins can be installed on any worktop or on their own with a siphon for a more minimalistic look. Vanities can be the choice for you, if you need more rim to have room for your personal bathroom products. And countertops and under-countertops are recessed into worktops and furniture, which give a luxurious “hotel”, spacious feel to your bathroom,” elaborates the spokesman. Customers get a luxurious feel when they choose a Strada vessel. The distinctive rectangular design is the key personality trait for this range. But for those who prefer circular designs, Strada has a selection of round and oval vessels to choose from, one that can add an interesting visual contrast to a rectangular design theme. In order to complete the washing area, Strada has impressive mirrors that come with or without subtle, integrated lighting. “These are mirrors that immediately reflect your style. A mirror always makes a space look bigger, in this case giving you an expansive view of the rest of your bathroom whilst bouncing of soft light,” the spokesman says. To add value to the showering experience, Strada shower trays are a must, says the spokesman. There is a wide range of sizes and shapes to choose from. They all come with the blade waste system. Instead of a plug, they feature a gleaming, stainless steel band stretching across one side of the pure white, uninterrupted, shower tray. To complete the bathroom design and complement the rest of the range, Strada offers its iF award-winning, straight lined mixers. “Besides their gorgeous looks, they come with adjustable regulators that allow you to control the direction of water and prevent splashing. Furthermore, these regulators have 5 lpm maximum flow rate, resulting in using much less water, while giving you the sensation of a full stream in your basin,” the spokesman says.